Maybe it's been a few weeks. Maybe it's been a few centuries. But DC Comics has rounded up J.M. DeMatteis, Andres Guinaldo, and Walden Wong again to top off December, 2014, with one more tale of our Dark and mysterious League of Justice. To QUOTE the Beatles: “I am he as you are he as you are me and we are all together”. 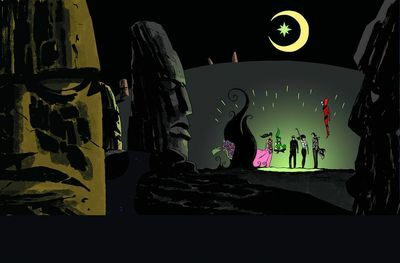 Firstly, in the Justice League Dark Annual, ol' John Constantine and Zatanna Zatara cast the K'am'deva curse, made the House of Wonders go kerblammo, and flung themselves and their teammates across space and time. Then, or maybe previously, in issue 35 we learned that Zatanna ended up in a place where time is new, magic is raw, and power is infinite. After that, in issue 36 we find Swamp Thing, Nightmare Nurse, Andrew Bennett, and Frankenstein at the end of existence where time is no more. 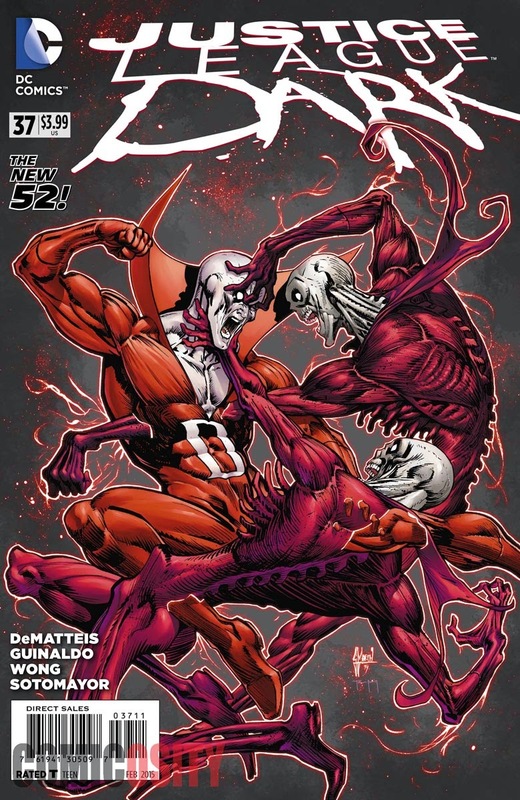 And now, low and behold, in issue 37 we find Deadman, Madame Xanadu, and Black Orchid in the Land of Now. Well, not “now” like you and I know. But a universe of “eternal twilight: no past or future, birth or death, sleep or waking”. A place that exists outside of time and populated by people who know that they are outside time, and understand the concepts of eternity and infinity. But only after our heroes escape the Zone of Colliding Moments, where a single moment infinitely folds in on itself. Which looks like fun, but apparently isn't. Good thing this title is chock full of magic. Otherwise this'd all be a whole lot of hooey. And hooey is not what you're looking for. Since the New 52 kicked off, Justice League Dark has danced, on and off, with the other superhero titles it shares a universe with. However, once we were thrown clear of Forever Evil, J.M. DeMatteis has taken our team away from Gotham and Metropolis and off to their own little mystical corner of the world. Or, since October, when we first kicked off this “Amber of the Moment” arc, out of the world. Which is an awesome thing. This arc is getting more and more Lewis Carroll-like with each issue. As if last month's insane immortal magical two-assed centi-slug composed of a most delicious magic weren't enough -- this month we have a tree with roots that stretch across creation, a ribbon of darkness where matter ceases to exist, and the transient ecstasy of the ephemeral. All good stuff. Unless you're our heroes. Then it's really bad stuff. But you're not our heroes. You're you. And just a singular you. Not all possible yous. So you can enjoy another issue of DeMatteis' absurdest fantasy with graceful, beautiful, and sometimes Daliesque art of Guinaldo and Wong. As with the last couple of issues, this is a book you can enjoy multiple times. In fact, I'd recommend it, as it may not make a whole lot of sense the first time through. I'm still trying to get accustomed to Guinaldo's take on Zatanna and Madame Xanadu (and Andrew Bennett, but he's not in this issue, so, uh, shhhhhh). In both cases, I think it's more a youthfulness to the faces in comparison to prior artists. This is, of course, more relevant in Madame X's face (that's apparently what we're calling her now...), as I like it when an artist can show the centuries of experience in a character with eternal youth, but it feels a bit off with Zatanna as well. And, yeah, that “Madame X” thing kind of bugs me. Not sure why! Maybe because “Xanadu” is already presumably a pseudonym and it feels forced to give her a nickname. Or maybe it's something about taking the “Zee” sound of Xanadu and saying “Ecks” instead. Which just reminded me of how Constantine calls Zatana “Zee” when really it would make more sense for him to call her “Zed” . . . which opens up all manner of wounds for those who wish he was still a Vertigo character. But that's it really. There's a lot to try and pick apart in the Now, where there is no past or future, yet people still perceive that our heroes were not there before and are there now. It's not like we have any definitive knowledge of what such a place would really be like, so I guess we'll just have to roll with it. If you're hung up on it, tell yourself that this story is being told how Madame Xanadu perceives it. That's also my explanation for all the continuity contradictions introduced in this month's Secret Origins. I'm really sorry about this. Be very-very grateful that Comic Book and Movie Reviews isn't one of those annoying sites that auto plays YouTube links. Brace yourselves; Whitney Houston is coming. 'One Moment In Time'. Most of the visuals in this issue reminded me of Salvatore Dali. 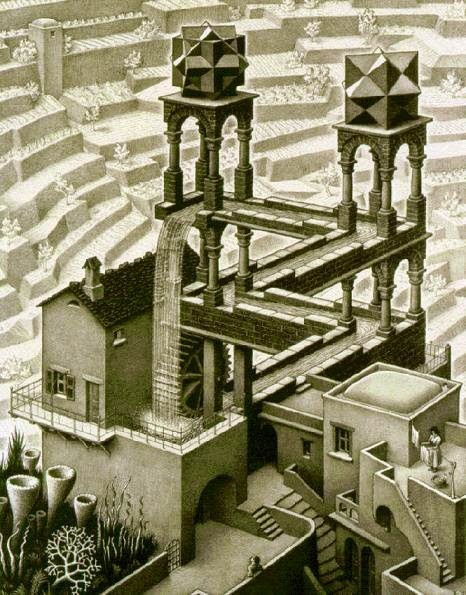 But one particular view of the city of Now -- floating in the void between the Zone of Colliding Moments and the ribbon of the Beyond Beyond -- reminded me of M. C. Escher's “Waterfall” lithograph. It was a passing thought, but as the issue continued I really liked the parallel of the visual paradox of the Penrose triangles to the perceived paradox of a city populated by people who live forever in one moment. Yes, this issue is full of paradoxes (which is certainly better than Parallax). Yet it feels a bit like it was written under the influence of something procured from the back alley markets of the far east. Which would explain why it bears more than a passing similarity to early twentieth century children's fantasy literature. But it's fun (as early twentieth century opium influenced children's fantasy literature should be). I'm sure we all had some expectations about what would transpire when our team of mystical folk were split apart and flung across time, but the story we got far exceeded my expectations. It was predictable in parts, but still managed to surprise at every turn. We started “Long Before Yesterday”. Then we were “Long Beyond Tomorrow”. Now we're in “The Shattered Now”. In a few weeks we'll see how they manage to pull themselves across the timeline so that we can lay a little Peaches & Herb down in the Music section. Well, obviously, they haven't been thrown across time. They're strapped in to an all new Thaumaton that Nick Necro built in the reborn Nanda Parbat to try and resurrect Doctor Occult but inadvertently merged the Houses in the process. Totally. Zatanna will just keep trying over and over for another week or century or three until she can just magically get the kids all back together again. Magic space boat. Remember the magic space boat? It can sail through time. It was all just a dream. You were there. And you were there. And you were there. The Beyond Beyond is a magic carpet ride, duh. Somewhere on Earth 2, John Constantine mutters the Aved'ma'k blessing and pull everyone to them. As the world ends. Oops.